A bypass surgery is named for the artery that will be bypassed and the arteries that will receive the rerouted blood. The development of atherosclerosis and PAD is influenced by heredity and also by lifestyle factors, such as dietary habits and levels of exercise. After obtaining a detailed history and reviewing symptoms, the physician examines the legs and feet, and orders appropriate tests or procedures to evaluate the vascular system. Blood pressure and pulses : - pressure measurements are taken in the arms and legs. Pulses are measured in the arms, armpits, wrists, groin, ankles, and behind the knees to determine where blockages may exist, since no pulse is usually felt below a blockage. Doppler ultrasonography : - direct measurement of blood flow and rates of flow, sometimes performed in conjunction with stress testing (tests that incorporate an exercise component). Angiography : - an x ray procedure that provides clear images of the affected arteries before surgery is performed. Blood tests : - routine tests such as cholesterol and glucose, as well as tests to help identify other causes of narrowed arteries, such as inflammation, thoracic outlet syndrome, high homocycteine levels, or arteritis. Spiral computed tomography (CT angiography) or magnetic resonance angiography (MRA) : - less invasive forms of angiography. Bypass surgery is an open procedure that requires general anesthesia. In femoropopliteal bypass or femorotibial bypass, the surgeon makes an incision in the groin and thigh to expose the affected artery above the blockage, and another incision (behind the knee for the popliteal artery, for example) to expose the artery below the blockage. The arteries are blocked off with vascular clamps. 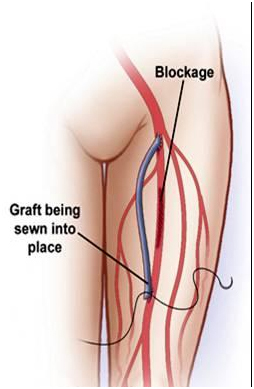 If an autogenous graft is used, the surgeon passes a dissected (cut and removed) segment of the saphenous vein along the artery that is being bypassed. If the saphenous vein is not long enough or is not of good quality, a tubular graft of synthetic (prosthetic) material is used. 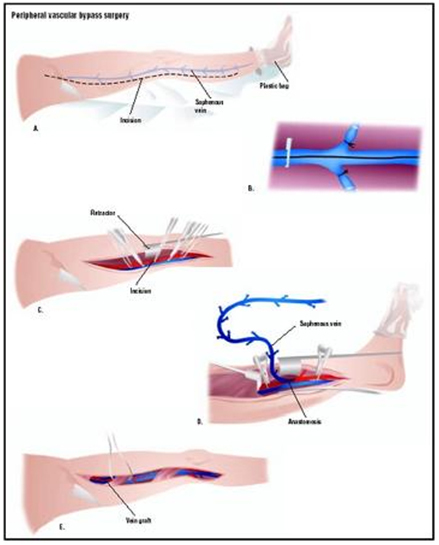 The surgeon sutures the graft into an opening in the side of one artery and then into the side of the other. In a femoropopliteal bypass, for example, the graft extends from the femoral artery to the popliteal artery. The clamps are then removed and the flow of blood is observed to make sure it bypasses the blocked portion of the affected artery. The risks associated with peripheral vascular bypass surgery are related to the progressive atherosclerosis that led to arterial occlusion, including a return of pre-operative symptoms. In patients with advanced PAD, heart attack or heart failure may occur. Build up of plaque has also taken place in the patient's arteries of the heart. Restenosis, the continuing build up of plaque, can occur within months to years after surgery if risk factors are not controlled. A femoropopliteal or femorotibial bypass with an autogenous graft of good quality saphenous vein has been shown to have a 60-70% chance of staying open and functioning well for five to 10 years. Aortobifemoral bypass grafts have been shown to stay open and reduce symptoms in 80% of patients for up to 10 years. Pain and walking difficulties should be relieved after bypass surgery. Success rates improve when the underlying causes of atherosclerosis are monitored and managed effectively. The risk of death or heart attack is about 3-5% in all patients undergoing peripheral vascular bypass surgery. Following bypass surgery, amputation is still an outcome in about 40% of all surgeries performed, usually due to progressive atherosclerosis or complications caused by the patient's underlying disease condition.